Archive for tag "Sustainability Management"
Ecosummit TV: Markus Becker pitches EcoIntense at Ecosummit Düsseldorf 2012. The Berlin-based smart green startup develops sophisticated software for health, security and environmental management (HSE). EcoIntense was founded in 2007, has got 35 employees, doubled its revenues 2 years in a row and now enjoys profitability. EcoIntense’s customer list is really impressive and features Siemens that uses EcoWebDesk in 3 of their 4 business units. Having reached so many milestones, Markus is interested in talking to late stage financial or corporate VCs that can add strategic value. Ecosummit TV: Tristan Foerster, Managing Director of ClimatePartner, talks about climate change management and explains what companies can do to protect the climate. First, companies have to measure, avoid and reduce greenhouse gas emissions. Then they can offset their residual carbon footprint which cannot be reduced any further by buying CO2 certificates in the market. In fact, we are doing it and cooperate with ClimatePartner as Ecosummit’s carbon offset partner. Together we made both ECO12 Berlin and ECO12 Düsseldorf climate neutral. Do you know other cleantech conferences that invest in being climate neutral? Ecosummit TV: Manfred Heil, Co-Founder and CEO of WeSustain, pitches the German Green IT startup at Ecosummit Berlin 2012. WeSustain provides a web-based software platform that supports the internal and external processes of sustainability management. WeSustain’s software helps companies measure, improve and communicate their sustainability performance. Manfred Heil, CEO and Co-Founder of WeSustain, pitches the Enterprise Sustainability Management (ESM) startup to investors at ECO11 in Berlin. WeSustain provides a software-as-a-service suite that helps companies improve their sustainability management across all products, processes and divisions. Think of it as the SAP of sustainability. Sustainability in everything we do – that’s one of the key principles of Nokia’s Sustainability Management presented by Michael Bueltmann, Managing Director (Public & Legal Affairs) of Nokia Germany. Another green success factor is lifecycle thinking, i.e. measuring and optimising the product carbon footprint across the whole product lifecycle. This includes the management of recycling processes. Michael says the key problem is the laziness of consumers who prefer to keep old devices at home. Here’s my idea: Renting smartphones instead of selling them and offering a reward for returning the old device to upgrade to the new one. Easy device upgrading also accelerates the rollout of new innovations. Nicole Roettmer, Founder and CEO of The CO-Firm, talked about Carbon Business Models at ECO11. The Carbon Opportunity Firm is a consulting boutique focused on strategy development and implementation in the areas of energy efficiency, energy mix, carbon offset, carbon certificate monetisation and many other smart green business models. Going green is smart. Here is our new strategy: Ecosummit is the Smart Green Business Network providing management consulting, marketing, event and media services to startups, investors, corporates and cities. Our goal is to contribute with a growing leverage to the fast transformation to the Smart Green Economy. 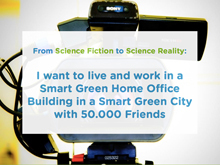 Smart stands for the ubiquitous use of information and communication technology (ICT). Green is about bringing Cleantech to the mass market and making sustainability the default strategy of every company in every industry. 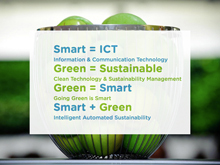 Being smart and green enables intelligent sustainability management, i.e. automated sustainability. Die schnelle Transformation zur Smart Green Economy ist die Lösung unserer globalen Klima- und Ressourcenprobleme. Jeder zweite Weltbürger lebt urban. Die Stadt spielt die Hauptrolle beim Aufbau der intelligenten grünen Ökonomie und muss zur Smart Green City werden. Smart steht für automatisierte Intelligenz dank ubiquitärer Informations- und Kommunikationstechnologien. Green steht für Nachhaltigkeit und Cleantech im Massenmarkt. Das Ziel ist automatisierte Nachhaltigkeit, die den City Footprint permanent minimiert. It’s startup time on Ecosummit TV. Markus Becker, Founder and CEO of Berlin-based Ecointense, pitches his smart green software startup to investors at Ecosummit 2011 (ECO11). Founded in 2007, Ecointense offers the sustainability management support system called EcoWebDesk, a software-as-a-service (SaaS) solution helping companies manage Health, Safety and Environment (HSE). Andreas Muth, Chairman of the Advisory Board of the German Bank Sarasin AG, talks about sustainable banking and investing. Employing 50 analysts Bank Sarasin tracks the sustainability performance of public companies and puts the best companies into their sustainability fund products. The key insight is that in recent years best-in-class sustainable public companies finally outperformed unsustainable companies on the stock market. Sustainability management pays off. That’s good news. The ultimate goal, of course, is to achieve 100% sustainable investments.